At right, a close-up of mouse brain tissue shows an engineered protein (stained green) being expressed by astrocytes, but no other cells. 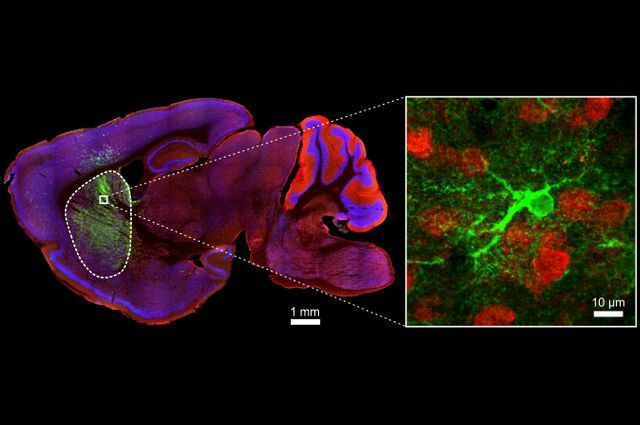 UCLA scientists used this technique to selectively silence astrocytes to explore their roles in mouse behavior. Repetitive behavior disorders are relatively common. One of the best known in this family is obsessive compulsive disorder, or OCD, which affects more than 2 percent of the U.S. population. Existing treatments, often medications, may not bring adequate relief for about half of those with the disorder. UCLA researchers have uncovered some of the basic brain mechanisms behind repetitive behavior, which may ultimately lead to new ways to treat psychiatric disorders, including OCD, at their root. The study, published in the journal Neuron, was led by Baljit Khakh, professor of physiology and neurobiology at UCLA. Khakh and his team focused on a type of brain cell called astrocytes, which are largely thought of as support cells, though much of their role in regulating neurons — and behavior — has remained uncharted. Khakh’s lab has been working on how astrocyte function relies on calcium signaling, a form of communication that cells use. 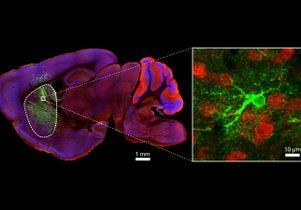 The team developed a method to dial down astrocyte calcium signals in the mouse brain. They created a variant of a pump, dubbed CalEx, which significantly reduced calcium elevations inside the cell. The team focused on an area of the brain called the striatum, known to be involved in movement and brain disorders. After treating healthy mice, they observed the behavior of the animals, and immediately saw a difference: When placed in an open arena, the treated mice spent significantly more time in the corners. The authors first attributed this to anxiety or to a motor control problem, but these mice performed just as well as untreated animals in tests of motor control and measures of anxiety. When the researchers looked more closely, however, they saw that the animals were actually grooming themselves — excessively. Their bouts of self-grooming were 450 percent longer than controls. When the team reduced calcium signaling in other areas of the brain, the mice didn’t exhibit the OCD-like behaviors, suggesting the striatum is key. That finding corroborated earlier evidence that the striatum controls self-grooming. Using a variety of tests to look at the different levels of function, from molecular to neurocircuitry, the team determined that astrocytes were regulating the activity of nearby nerve cells, by altering levels of the neurotransmitter GABA in the striatum. “Over a decade ago, researchers had found that in humans, the early stages of Huntington’s disease often are marked by obsessive-compulsive-like symptoms,” Yu said. “We wanted to see if the underlying mechanism also had anything to do with astrocyte calcium signaling.” They found that when they gave mice with early Huntington-like symptoms a compound to block a key step in the calcium signaling process, the mice stopped their OCD-like self-grooming behaviors. Huntington’s disease is a progressive movement disorder involving the breakdown of cells in the brain. A key contribution of the new study is the Khakh lab’s development of a novel method of silencing calcium signaling within specific circuits of the brain. The existing method is to knock out the molecules completely, across the whole brain and the whole lifespan. But that method has not so far produced any clear changes in behavior, as the current study did. The results may pave the way for the development of novel treatments for OCD, the researchers said. Khakh and his team hope their findings may also help lead to development of new therapies for other psychiatric disorders. In addition to Khakh and Yu, other study authors are Anna Taylor, Jun Nagai, Peyman Golshani, Christopher Evans and Giovanni Coppola, all of UCLA. The study was funded mainly by a National Institutes of Health Directors Pioneer Award to Khakh and an American Heart Association postdoctoral fellowship to Yu.